YOM: Full Service Court Reporting is an Ethics First Firm. This means that we promise to maintain the highest level of professionalism and ascribe to the National Association’s Code of Ethics. 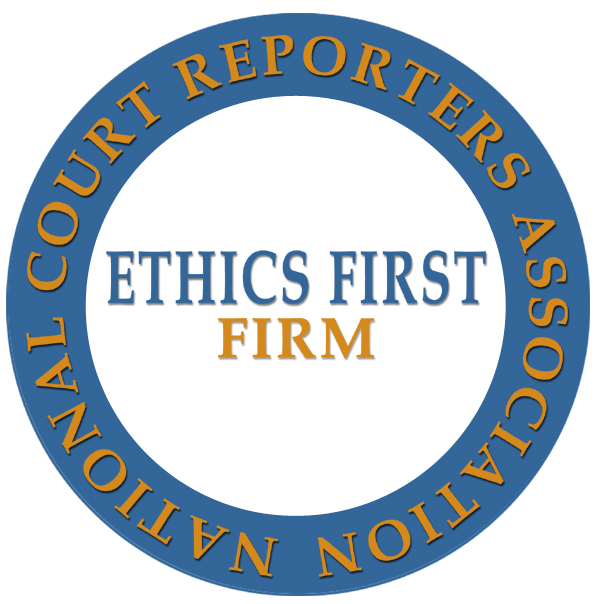 It should be noted that participating in the Ethics First Program is voluntary – not all court reporting firms choose to participate, nor do they qualify to do so. To provide court reporting and video services without equal. To serve regional and national clients with integrity, dedication and commitment. Gold Standard Service Service-mindedness is our culture and forms the foundation for the way we work with clients, contractors and staff. That's why it's in our name. Professionalism From the way we run our business to the people we hire, managing time and resources efficiently is a principle that governs the way we operate. Respect and Courtesy We value people and relationships, above everything. Building long-term working relationships is like growing our family. Accessible Contacts We respond to requests with a sense of urgency and daily on-call reporters are ready to go at a moment's notice. Listen and Understand Understanding our clients' expectations is of utmost importance. Leading-Edge Tech We are committed to using the latest technology and offering support and training in its use. Great Value We are committed to having our customers satisfied that the value of the service is in line with the cost. Our rates are competitive and there are absolutely no surprise charges. Fair Treatment Since our inception in 1972, we always have and always will provide equal terms, services, and rates to all parties.